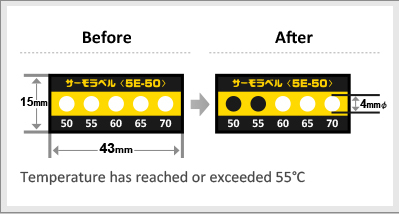 THERMO LABEL5E single-use indicators irreversibly change its color from white/pale yellow to black by reaching or exceeding color changing temperature. At 5℃ interval upto 130℃ and at 10℃ interval from 130℃ and more. Color change method utilize melting point of refined meltable pigment to achieve high accuracy. Apply on flat surface. THERMO LABEL® 5E might drop from uneven applying surface. 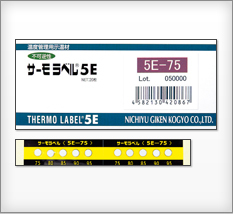 Do not cut THERMO LABEL®5E. This may reduce the durability of product and cause abnormal color change. Do not use THERMO LABEL 5E under liquid plasticizer* affected condition. When THERMO LABEL 5E absorbs the plasticizer, central white circle may change its color and/or may impact adhesion of THERMO LABEL 5E. THERMO LABEL® 5E contains no toxic substance according GHS classification except from 5E-100, 170 and 210. Please refer to MSDS of appropriate products for detail. THERMO LABEL® 5E doesn’t contain chemical substance prohibited in the RoHS directive. The information in this sheet is believed to be correct as of the date of issue Nor the selling, nor the producing company make no warranties, expressed or implied, including, but not limited to, any implied warranty of merchantability or fitness for a particular purpose or course of performance or usage of trade. The user is responsible for determining whether this product is fit for a particular purpose and suitable for user's method of use or application. Given the variety of factors that can affect the use and application of this product, some of which are uniquely within the user's knowledge and control, it is essential that the user evaluate this product to determine whether it is fit for a particular purpose and suitable for user's method of use or application.